We've got you covered. Leader in Concrete Alternatives. The long-accepted solution for repairing damaged gas island foundations involved removing the pumps and the crumbling concrete, re-pouring fresh concrete, reinforcing it with a metal band around the edges and then painting it. Or there was the band-aid approach of just painting it. In either case, there were flaws. The standard replacement included a shiny new metal band that would someday end up just as rusty as the one it replaced. And the painted solution was ever so temporary. 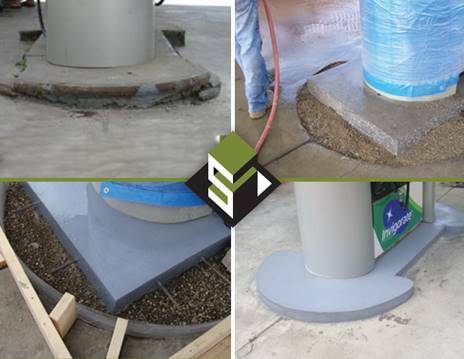 Enter epoxy-mortar concrete alternatives, like the one used in Simon Surfaces’ Gas Island Restoration System. If you’re a station owner looking for a proven solution that results in durable, clean-looking gas pump areas, and minimized ongoing maintenance, check out these examples. 2019 © Simon Surfaces. A division of Simon Roofing.